Dinosaur eggs from the Lower Cretaceous are worldwide rare as compared to those from Upper Cretaceous deposits. In China, they were only reported in Liaoning Province. In a paper published in the latest issue of Vertebrata PalAsiatica, paleontologists described a new type of dinosaur eggs from the Lower Cretaceous Hekou Group in the Lanzhou-Minhe Basin, northwestern China, and established a new oogenus and a new oospecies, within a new oofamily. This finding has important implications for understanding the diversity and the geological and geographical distribution of Early Cretaceous dinosaur eggs in China, as well as the evolution of dinosaur eggshell structure. The new specimen is an incomplete and highly fragmented egg, discovered in outcrops near the border of Yongjing and Lintao counties, in the central region of the Lower Cretaceous Lanzhou-Minhe Basin. The Lanzhou-Minhe Basin is located on the border of Gansu and Qinghai provinces, and represents a typical Mesozoic-Cenozoic intracontinental rift basin in western China. The Early Cretaceous outcrops in Gansu Province have yielded numerous dinosaur skeleton remains and tracks, but dinosaur eggs have not been reported so far. 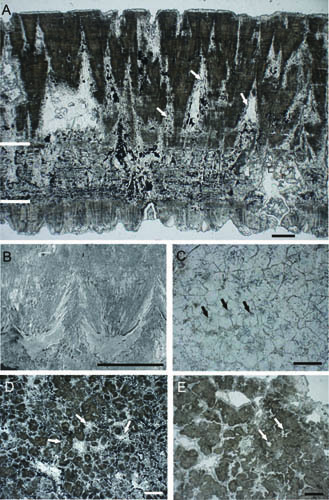 The new oospecies, Polyclonoolithus yangjiagouensis, can be distinguished from other known dinosaur eggs by the combination of eggshell micro-features, such as branched eggshell units lacking a compact layer near the outer surface, interlocking or isolated multi-angular eggshell units as viewed in tangential sections, and irregular pore canals. Researchers attributed it to a new oofamily, Polyclonoolithidae. “Dinosaur eggs from China largely come from the Late Cretaceous deposits, with occasional reports from the Early Cretaceous in Liaoning Province, northeastern China. The new discovery expands the geological and geographical distribution of the fossil record of dinosaur eggs in China and may reveal the origin of eggshell microstructures of spheroolithid eggs”, said Dr. ZHANG Shukang, corresponding author of the study at the Institute of Vertebrate Paleontology and Paleoanthropology (IVPP), Chinese Academy of Sciences. “The new oofamily Polyclonoolithidae shares a close relationship with the oofamilies Dendroolithidae, Dictyoolithidae and Similifaveoloolithidae. It may represents a more basic type of dinosaur egg, which had been extinct in Late Cretaceous. The discovery of this new oofamily possibly indicates there is an unknown dinosaur egg fauna preserved in the Early Cretaceous deposits of China. It has the same eggshell formation mechanism as that of dendroolithid, dictyoolithid and faveoloolithid eggs, and shows some relationships with spheroolithid eggs. It may reveal the origin of eggshell microstructures of spheroolithid eggs”, said XIE Junfang, lead author of the study, Zhejiang Museum of Natural History, Hangzhou.